Yes, also bacteria seem to have an immune system. Bacteria frequently become attacked by phages and viruses, so they need protection too! Here I want to briefly introduce the CRISPR/Cas system which is a very interesting type of bacterial defense system using former viral DNA sequences to guide bacterial DNA endonucleases to cellular targets where viral DNA is present. It has always been hypothesized that CRISPR/Cas could be used for biotechnological non-invasive genome editing. However, recently a number of breakthroughs concerning this application have been described. In the following I especially would like to discuss three Science journal; papers that, in my opinion, have been groundbreaking in paving the way for real future applications of CRISPR/Cas and on the other hand helped to understand the molecular basis of this system. Here I will especially concentrate on the type II CRISPR/Cas system (of in total three). In general a bacterial immune response against a viral invader can be split up into three phases: Adaption, expression, and interference. Fig. 1 schematically shows how the type II CRISPR/Cas system is currently assumed to work during the expression and interference phases. Fig. 1: Schematic depiction of the type II CRISPR/Cas system present in bacteria to destroy invading DNA originating from viruses. The CRISPR/Cas gene cluster contains previously obtained sequence information about foreign DNA (colored triangles) which are separated by repeats (black rectangles). 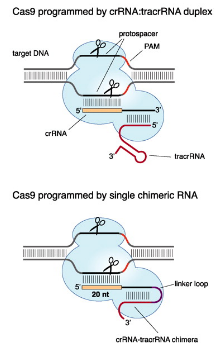 Upon induction this information is transcribed into pre-crRNA together with the expression of the Cas9 protein and so-called tracrRNA which serves as a universal linker to connect crRNA with Cas9. In the following steps tracrRNA and pre-crRNA are cleaved to smaller sizes at least twice. Now the crRNA-Cas9-tracrRNA complex is able to bind foreign DNA at a homologous site termed “protospacer” which is followed by a second, but very short identifier called PAM (protospacer adjacent motif). Once stable binding has been achieved Cas9 seems to cleave the invading DNA and thereby induces double-stranded breaks that inhibit the expression of viral genes. Scheme created by myself, based on (1) Supplementary Fig. 1. Even though Fig. 1 depicts some of the molecular details that occur during a CRISPR/Cas mediated response there is probably more to the system. Especially during the adaptive phase that governs the incorporation of DNA fragments into the bacterial genome important functional key features are still unidentified. Soon after the first functional properties of the CRISPR/Cas system became evident in the late 1980s researchers began to hypothesize about the biotechnological usability of this defense system. Since then the expression and interference phases have been studied very extensively and especially during the last couple of months some exiting insights have been gained with regard to an actual application by different researchers. Emmanuelle Charpentier and coworkers described in a proof-of-principle study how a fused and custom made crRNA-tracrRNA can be applied to target sequences of interest in a DNA plasmid and in addition identified the two Cas9 protein domains that are responsible for the double-stranded target DNA cleavage (Fig. 2) (1). Partially based on Charpentier’s groundbreaking work, in a second and third paper published last month, researchers from the Massachusetts Institute of Technology and Harvard Medical School describe an exciting approach to silence entire gene loci in mouse and human cellular DNA. The key to successfully being able to target specific sequences in eukaryote cells seems to have been the co-delivery of an expression vector including both pre-crRNA sequences and the Cas9 genes (2). This approach also makes use of the chimeric crRNA-tracrRNA hybrid (Fig. 2) that mimics the naturally occurring crRNA:tracrRNA duplex described by Charpentier and colleagues (1). In a parallel study targeting rates of 4 to 25% under different conditions are described. In addition 40% of all human exons are identified by a bioinformatic approach as being potentially available for CRISPR/Cas silencing. Cloning these target sequences into a 200 base pair format for the first time allowed the creation of a library describing potential target sites in the human genome (3). Fig. 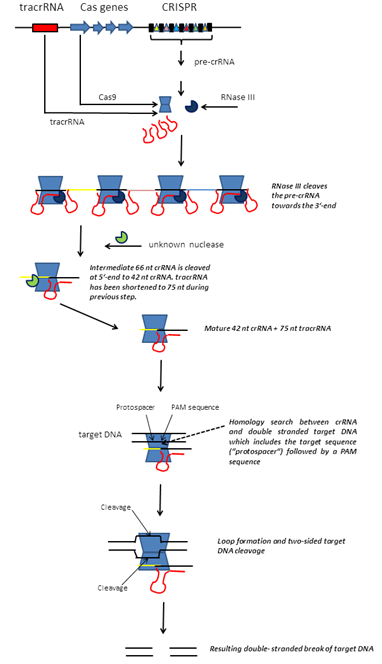 2: Schematic depiction of the the naturally occurring crRNA:tracrRNA duplex which in conjunction with Cas9 is able to cleave viral DNA in a target specific manner (top). By creating a linker loop that fuses two functional RNA sequences it became possible to engineer a crRNA-tracrRNA chimera that, based on experimental evidence, has the same functionality as its natural counterpart and has been proven to be very effective for genome targeting purposes in eukaryotic organisms (bottom). Based on (1) Fig. 5. I consider the CRISP/Cas system extremely interesting because of its seemingly simplistic nature consisting of only a cleavage protein, a target, and a target-identifier. Whether this is the whole story remains to be seen, but some of the most important functional elements now seem to have been identified on a molecular level. The construction and usability of an artificial linker which connects RNAs and endonuclease demonstrates how far knowledge has proceeded. Or in Richard Feynman’s famous words: “What I cannot create, I do not understand“. We might not understand it completely, but at least we can “create” an important part of it. I am confident that CRISP/Cas will play a very important role in bacterial/industrial biotechnology and also genome editing in the future because it dramatically decreases the challenges that accompany the silencing of eukaryotic genes in their native context. By further advancing knowledge and consequently the technology it might even become possible to use the system for genome editing through achieving controlled and sticky-end like double-stranded breaks. This would enable the ligation of desired sequences into eukaryote genes. It would not be the first time that a giant leap across the phylogenetic divide is made. The bacterial Taq polymerase used during PCR everyday around the globe is just one example how small the world can be at the molecular level. Darwin would have enjoyed it. (1) Jinek M. et al., A programmable dual-RNA-guided DNA endonuclease in adaptive bacterial immunity, Science 2012 Aug 17;337(6096):816-21. (2) Cong L., et al., Multiplex Genome Engineering Using CRISPR/Cas Systems, Science. 2013 Jan 3 [electronic publication ahead of print]. (3) Mali P., et al., RNA-Guided Human Genome Engineering via Cas9, Science. 2013 Jan 3 [electronic publication ahead of print].